Now think for a moment about the relationship between joy and strength. When you have a joyful marriage, it’s not terribly hard to resist sexual temptation. When you have the joy of serving in an area of your spiritual gifts and passion, you find yourself looking forward to being a servant, not tempted to drop out. In general, there is an inverse correlation between joy level and vulnerability to temptation. The higher your joy, the less likely Babylon is to be tempting. You need to develop a joyful life if you want to make it through to the end. 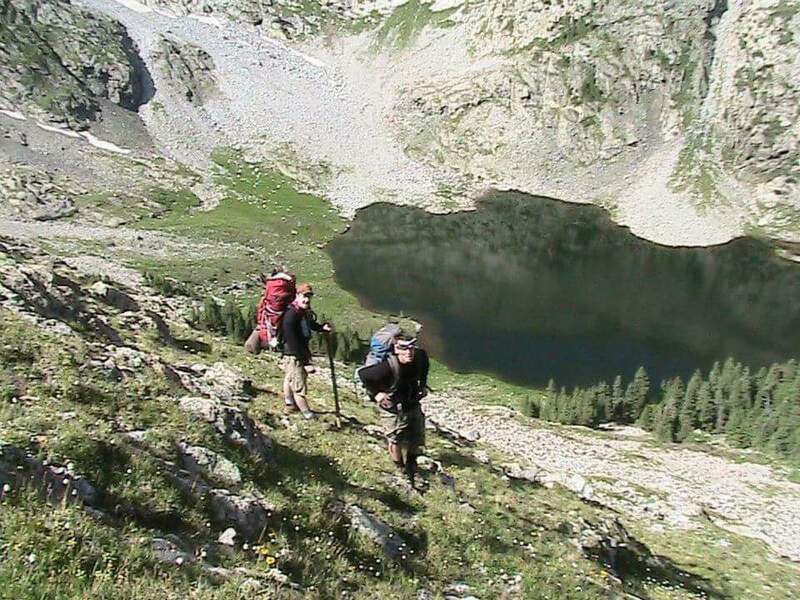 Several years ago, I took my two oldest boys to Deadman Lakes in Colorado. A place I first went to when I was a boy with my father and brother. It was our rite of passage in to manhood. So, when Cole and Clinton were of age, I took them as well. Cole was 15 and Clinton was 12. I got cold last night so I decided to go to bed a little early. Since my bed is in the cook area under the rain fly, the boys had to leave. They decided to go fishing in the shallows where the fish were spawning. I could hear them laughing like it was Christmas morning. He ran back over the rise to fish some more. I lay in my purple sleeping bag with my face to the lake and began to weep. “Thank you Lord for my boys. I suppose I prayed that about 20 times while the tears puddle around my cheeks in my sleeping bag. It was a very precious moment and one I will cherish the rest of my life. I wondered why Clinton ran over the rise to tell me he caught a fish. I had seen him catch them yesterday and earlier that day. I imagined him landing the fish, laughter dancing between brothers as they together got the hook out of the fish’s mouth and put it back in the water. Then Clint, with joy still bubbling out—not wanting to waste any of it—brought me some as I lay in my purple sleeping bag. Is that the nature of true and pure joy—the giving and the sharing of it? He didn’t come tell me about the fish because he needed my approval. He knows he already has that. He didn’t come tell me the good news because he wanted me to help him do something or to get anything from me. He came and told me the good news because joy had filled him up and he wanted to share it. That brings me to another question: Can one give joy or must it be shared? I suspect that true joy that anyone else experiences is joy-overflowed. Clint didn’t’ give me manufactured joy. He shared his joy. And in the sharing —I was filled. But, as I was filled—none of his joy diminished. But where did Clint’s joy come from? Did his joy come from the act of catching a big trout? Can true and pure joy come from an accomplishment? I don’t think so. I think it is nurtured in relationship. No relationship—no joy. As I have thought about this journal entry written at 12,000 feet above sea-level so many years ago, I have wondered if somehow joy is tied to sorrow. Perhaps it is accentuated by sadness. Towards the end of his life Jesus was comforting his disciples about his soon-coming death and said that their sorrow would be turned into joy. Maybe when we are acutely aware of what sin has done to this world and the utter ruin that seems to dominate the headlines, it could be, if we let it, a reminder of the joy that is promised to us in the coming life—a joy unspeakable and full of glory. If we don’t bow our knee to Babylon. It we stay true to the Lord. If we keep walking in obedience—a long obedience in the same direction. Maybe when Clint ran over the little rise and told me about the fish he caught he really just poked a hole into heaven. To the degree we stay true to the Lord and are diligent to bring ‘up there down here,’ we are joining Jesus in poking holes into heaven. And that is a good thing because this world needs all the light it can get. And I need the joy. This entry was posted in Uncategorized and tagged Christian maturity, grace, hope, joy, soul care, spiritual formation. Bookmark the permalink. This spoke to me today. Thank you for sharing. Very nicely written. Thank you for sharing your joy. I’m thankful to God that my life is now focused on Him and I’m getting to now experiance His overflowing joy. There was a time that there was no joy. There’s nothing ever going to steal my joy again. Thank you Jesus.